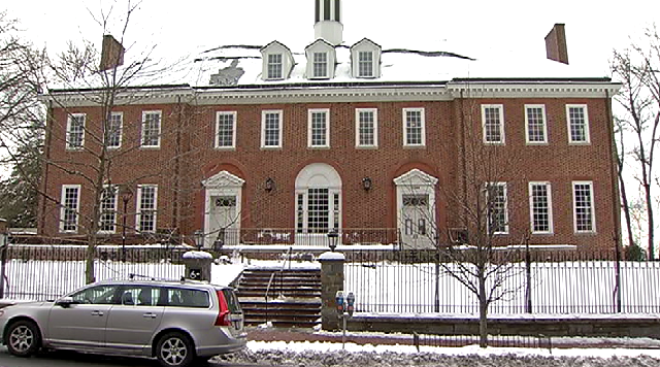 A burst pipe in a sprinkler system damaged historic collections at the Georgetown Library, sending water trickling through all three stories. On Friday, library employees found the top-floor sprinkler system had burst. Library officials said it was an isolated leak that drained down the walls of all three floors. A disaster recovery team was on site Wednesday. Oh, my. Fabled Georgetown Library closed. Water pipes burst, sending water down all 3 floors. Historic collection damage being assessed. The Georgetown Library, a branch of the D.C. public library system located at 3260 R Street NW, is home to a rare collection of District artifacts known as the Peabody Collection. A spokesman for D.C. libraries said a box of artifacts from that collection sustained water damage. Those items are some of the newest in the collection and have been taken to restoration facilities at the Martin Luther King Jr. Memorial Library downtown. The Georgetown Library was badly damaged by a fire in 2007. It took three years of renovations before it reopened. Library officials said Wednesday that a collection of photos of the fire was also damaged by the sprinkler leak. Those photos were also taken to the downtown facility to be restored. Officials said they were lucky that the sprinkler head didn't blow, or water would have sprayed over all the collections. The rest of the library sustained minimal damage, but the building has been closed since the leak was discovered. The closure is expected to last about three weeks. The pipe burst as sub-freezing temperatures continue to blast Washington, D.C.